Climateer Investing: "US venture capital activity so far this year in 15 charts"
"US venture capital activity so far this year in 15 charts"
The 2Q 2018 PitchBook-NVCA Venture Monitor, created in partnership with Silicon Valley Bank, Perkins Coie and Solium, provides a snapshot of the VC landscape by delving deep into data on fundraising, exits, valuation trends and more. For a summary, we've put together a collection of charts from the report, which is available to download for free. Through the end of 2Q 2018, $57.5 billion has been invested in US VC-backed companies, a number that exceeds the full-year total for six of the past 10 years. During the first half of the year, 94 financings have totaled more than $100 million and 42 have been at unicorn valuations. There was more venture capital invested during 1Q 2018 than any quarter since at least the beginning of the decade, and it's followed closely by 2Q 2018. 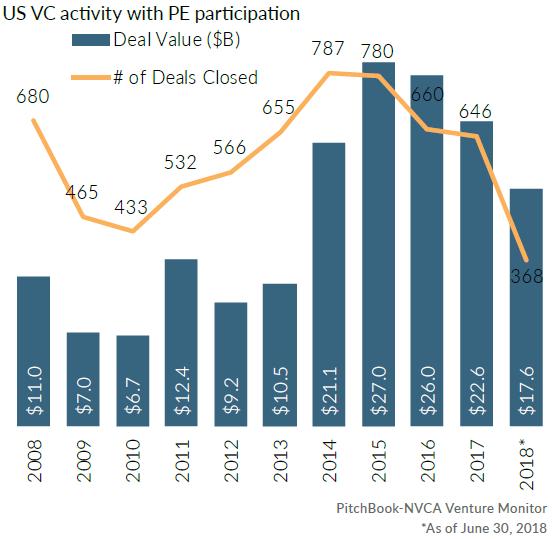 This year is on pace to be the fifth consecutive year that more than 1,500 deals are completed with participation from nontraditional investors, including private equity firms. 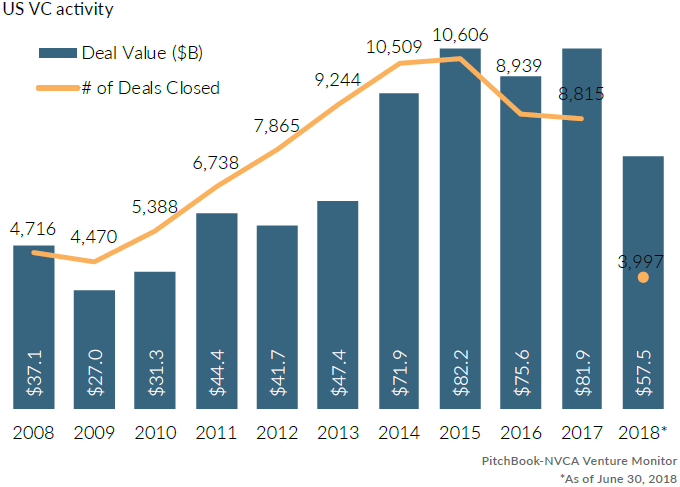 PE firms alone have been involved in 368 VC deals so far this year.